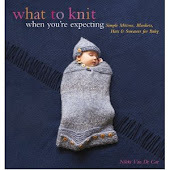 What To Knit When You're Expecting: Let's Talk About Some Knitting, Shall We? Let's Talk About Some Knitting, Shall We? I am so close to being done. I have to bind off, block, and that is all. And knitting the leaves at the end there was way fun. But I am losing faith in this project. For one thing, I think I may have picked the wrong yarn. What looked like a muddled ocean on the skein is looking more like some kind of striping business. I like the feel and weight of the yarn itself, but the dye pattern is just not working for me. It's impossible to tell how I'm going to feel about it until it's blocked, of course, but since this was knit with the intention of being The Shawl I Wear At My Wedding That Counts As My Something Blue, it kind of has a lot riding on it, and I don't want it to be something I feel merely okay about. But time's a-wasting, and if I'm going to have something else be TSIWAMWTCAMSB, I'd best get going. Enchanted is actually finished. They're socks for a soon-to-be seven-year-old, so, you know, they don't take long. I admit, I'm also working on Cherry, and I totally stole the Little Birds, but it just seemed so appropriate. 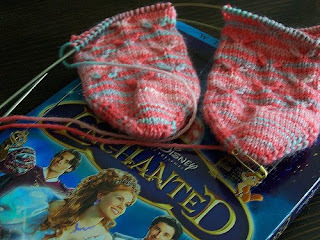 I love love knitting things from the very beginning. Dyeing the yarn specifically for a specific project, and then knitting up a design specifically for a specific idea. The control is heady, but more than that, there's something so pleasing about putting the extra mile in. (I do realize that I skipped a step. I should be able to spin said yarn, too. I plan on it, one of these days. I'm drawing the line at raising said sheep, though). I don't have a finished photo because the recipient hasn't received them yet--but her birthday's in a month, and that'll be fun and charming and once the dust has settled, I'll get her to wiggle her toes for the camera. This is so close to being done. And yet is not done. Because I'm stupid, and I'm running out of yarn. Has be the best-written pattern I've ever come across. So clear, so concise, and so clever. It was a fun and thoughtful knit, and I just know that it will look good and I will wear it all the time. If, you know, I could just finish it. It's not the end of the world. Knitpicks Shine Sport is not exactly hard to obtain. I will simply order another skein or two. But I'm waiting until I've got a big enough order so as not to pay for shipping, and that'll depend on whether I need to buy more yarn (if, say, I end up disliking Laminaria after all). It's all going to come together. So. Since I can't knit Cherry for a while, I cast on Rusted Root. They are kinda similar. They're knit differently, (top down versus bottom up, all in once piece versus lots of pieces to sew together) but they are definitely of the same aesthetic. Will I wear them both? You betcha. And let me tell you, I am flying through Rusted Root. Cherry was fine, it was well done, I knit it, blah blah, but Rusted Root you can see the sleeves start to puff, and you just want to get to the next step, faster pussycat, kill that stitch! There is, potentially, a slight yarn problem. 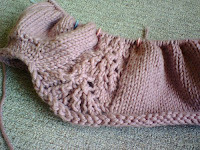 I'm knitting with Knitpicks Main Line. 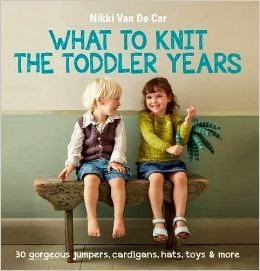 And it's a swell yarn, I have to say--I'm surprised it's not more popular. It seems to get softer even as I knit it, and it's got a fair amount of stretchiness while still feeling very cottony. And look at that color! That is a beautiful color! But. Ahem. It's worsted weight. And yes, I knew that when I bought it. Some instinct told me that this was the yarn for me, and that something like Cotlin would be too drapey, and the sleeves wouldn't puff. We're walking the line here. The sleeves are puffing, all right. The question is whether the sleeves and the sweater too will stand up on their own, like ghost clothes or something. Like Willow puffing up Tara's dress for comfort. That was creepy. It's not quite that bad. I hope. Please?